Driven by advances in technology and increases in manufacturing scale and sophistication, the cost of photovoltaics is declining continuously. There are several million PV systems distributed all over the world, mostly in Europe, with 1.4 million systems in Germany alone:5– as well as North America with 440,000 systems in the United States, The energy conversion efficiency of a conventional solar module increased from 15 to 20 percent since 2004:17 and a PV system recoups the energy needed for its manufacture in about 2 years. 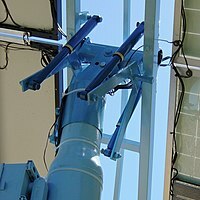 In exceptionally irradiated locations, or when thin-film technology is used, the so-called energy payback time decreases to one year or less. :30–33Net metering and financial incentives, such as preferential feed-in tariffs for solar-generated electricity, have also greatly supported installations of PV systems in many countries. The levelised cost of electricity from large-scale PV systems has become competitive with conventional electricity sources in an expanding list of geographic regions, and grid parity has been achieved in about 30 different countries.